Connecting AccuRanker to Reportz can be done in just a couple of simple steps. First, from the app homepage, or any other page go to your profile image in the top right corner, click on it to expand the dropdown, and select “Sources”, which should be directly below the “Edit profile” option. 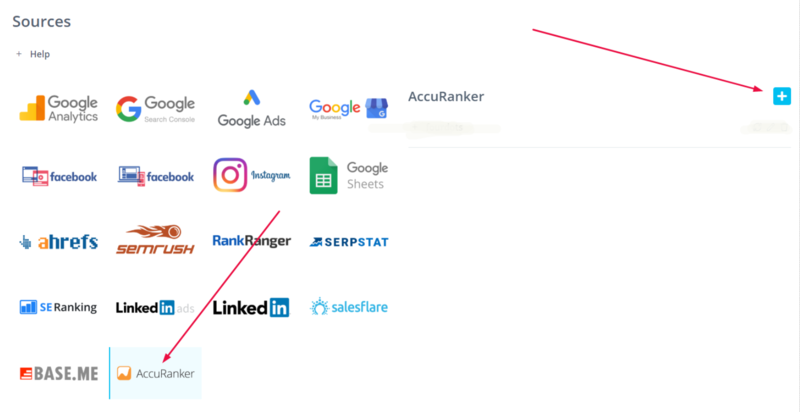 Find AccuRanker in the list of available data sources, and click on it to get the option on the right to create a new account. Click on the "+" button to add new account. You will now be presented with a window in which you need to insert custom account name. By clicking on Submit, you will be taken to AccuRanker's authorization page, where you’ll need to login (with your AccuRanker info, of course) and simply click on the “Authorize” button. And there you go, as soon as AccuRanker processes your request, you’ll be able to go back to Reportz and start creating widgets with AccuRanker data. IMPORTANT NOTICE: In order to connect your AccuRanker account you need to have their package that contains at least 1000 keywords.